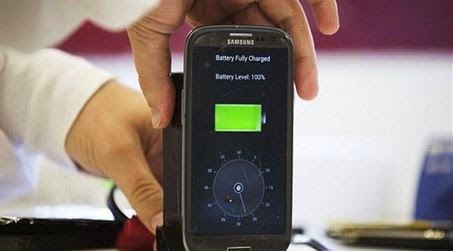 The team of researchers from the United States to develop a spongy battery can charge Alhaotf phones within a very short period of just 30 seconds, so as to have the fastest energy provider for smartphones in the world. You thanks dependence on nanotechnology. As researchers said they were able to configure a combination industrial molecules, where they worked on integrated inside the battery to act as a sponge absorbs very large amounts of energy and then stored within the battery, and it is to be used in the recharge electronic devices and mobile phones within 30 seconds only. According to the research team, this project is still under development, as the first experimental model so huge compared to smart mobile phones, and researchers working on the effort that is being developed for Tko smaller. The researchers explained that the new their product was made from raw materials called it "peptides membership vitality" and these molecules is amino acids series has special properties where able to store enormous dun energy, as AHA does not contain any harmful materials to human health Baladfah to own cost. This and the team of researchers plan lies in the development of this new technology to also include cars, where these batteries will supply car batteries within two minutes or three minutes and lasts for 3 years, to be a better alternative than the one that we use today.